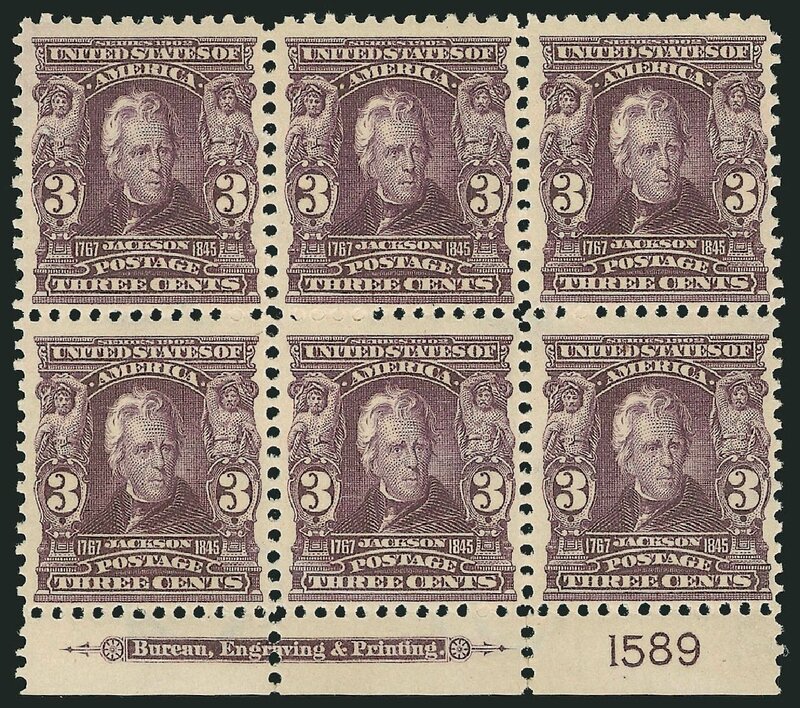 USA (Scott 302) 1903 JACKSON 3¢ BRIGHT VIOLET (TOP PLATE) Wide top margin plate block of 6 (plate #1586). 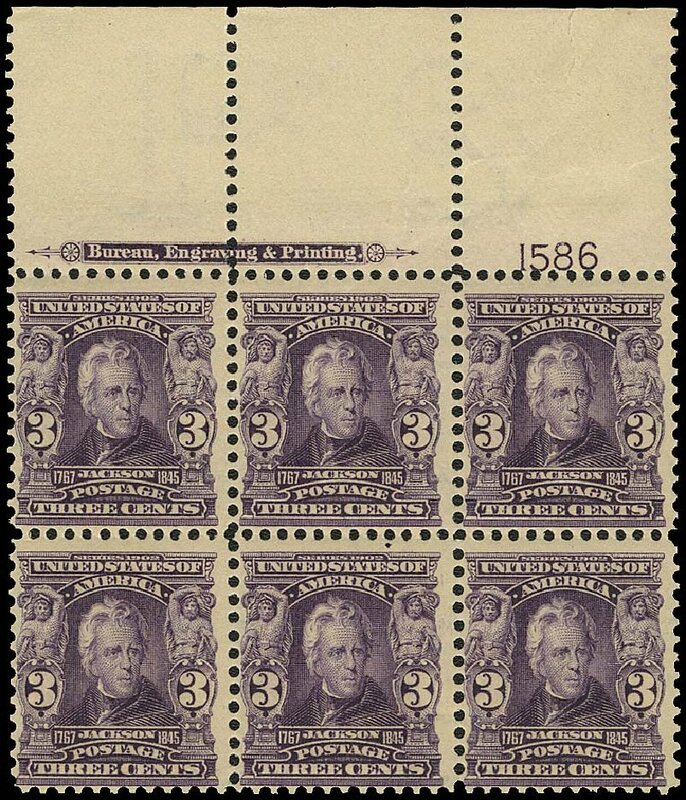 Stamps all MINT never hinged, paper adherence in ungummed selvage. Fine to very fine. Cat value $800. 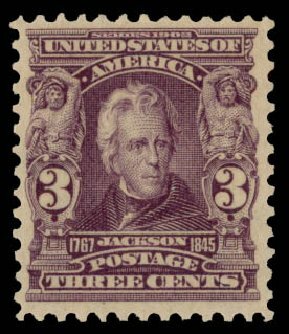 1903, 3¢ bright violet (Scott 302), o.g., never hinged, a brilliant fresh example with very intense color, Very Fine, 1999 A.P.S. certificate. Scott $130. Estimate price $100 – 150. 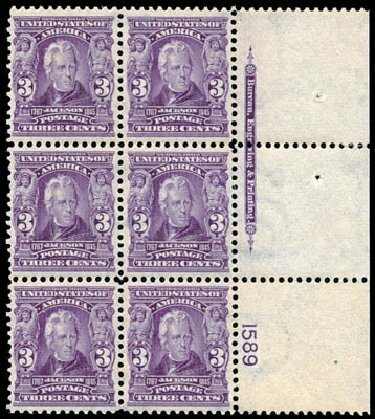 1903, 3¢ bright violet. 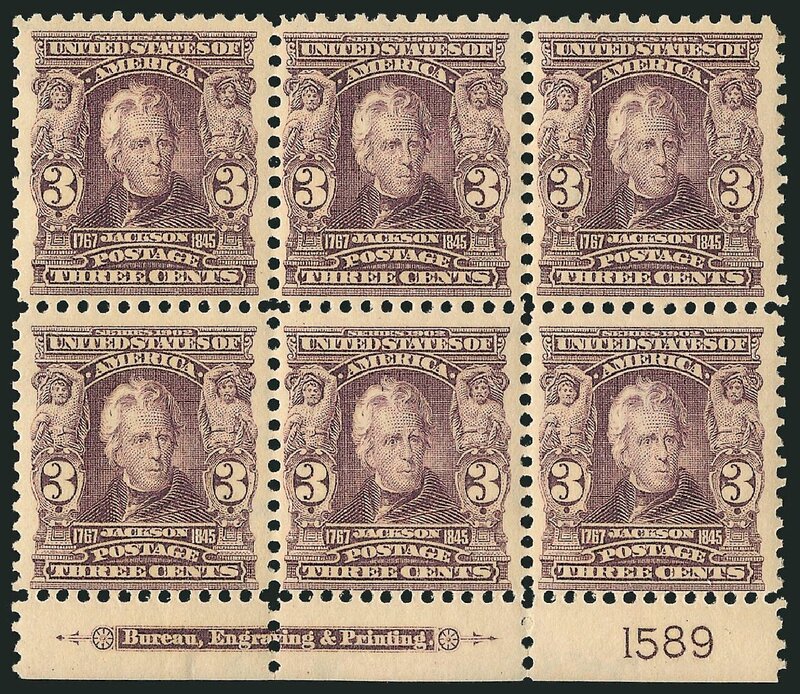 Right margin plate “1589” block of 6 with imprint, o.g., never hinged, well centered within wide margins, rich bold color, Very Fine and choice, a tough plate so nice. Scott No. 302; $1,350. 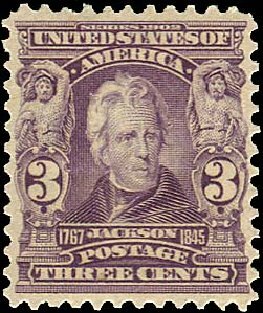 1903, 3¢ bright violet (Scott 302), o.g., never hinged, impressive example featuring huge JUMBO margins and an incredible depth of color, a very unusual stamp when found with margins with these proportions, Extremely Fine, 1992 P.F. certificate. Scott $130. Estimate value $200 – 300. 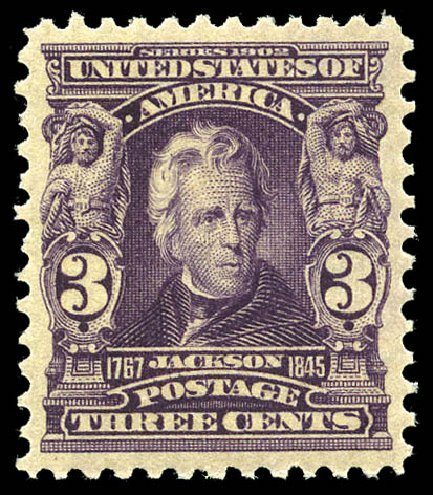 1903, 3¢ bright violet (Scott 302), o.g., very lightly hinged, mathematically centered with large, well balanced margins, Extremely Fine to Superb, 2014 P.S.E. certificate noting “disturbed o.g.”, though there is barely a trace of sweating to remove a hinge. Scott $50. Estimate value $100 – 150. 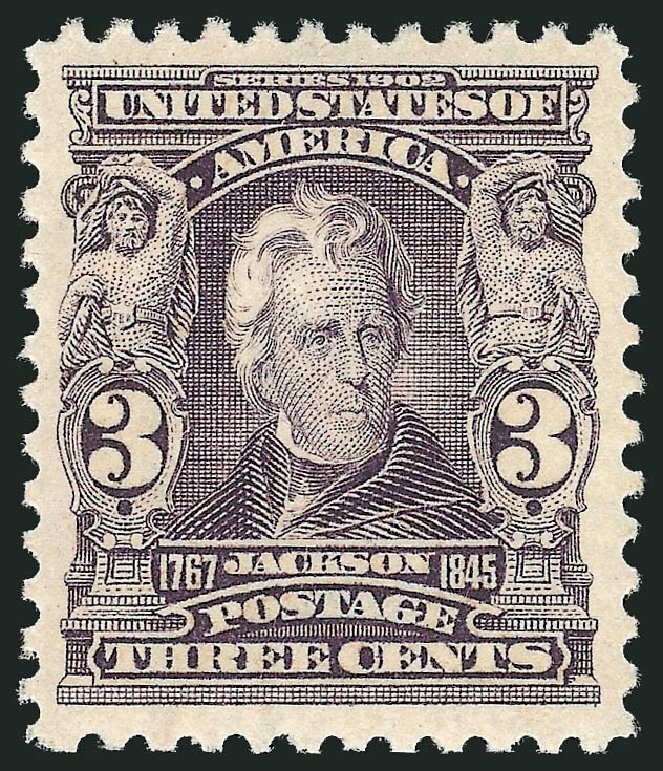 USA (Scott 302) 1902 JACKSON 3? 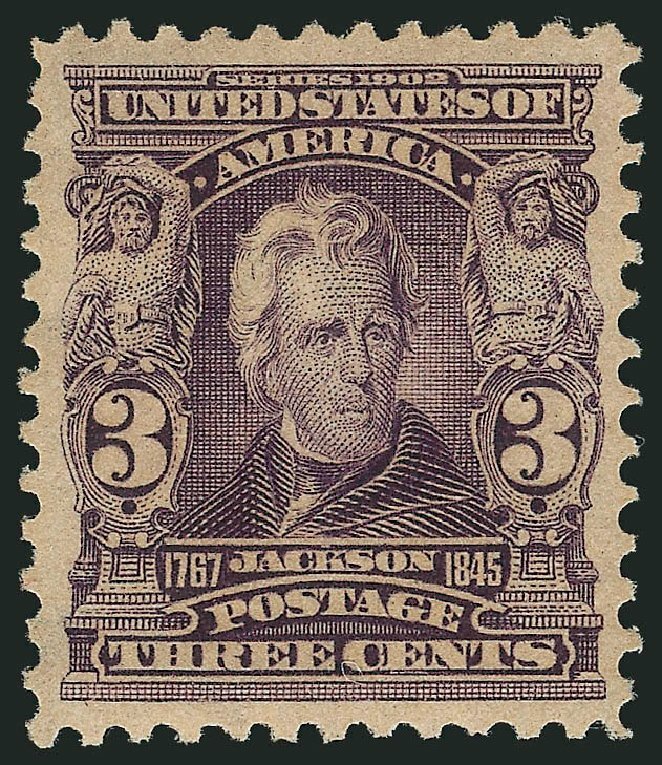 BRIGHT VIOLET Extremely fine centering for this typically difficult stamp. MINT never hinged. Cat $130. 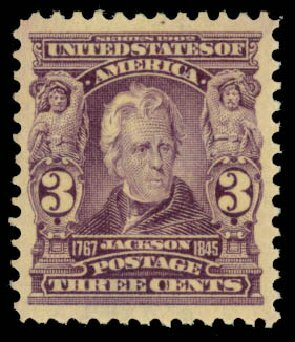 1903, 3¢ bright violet (Scott 302), o.g., never hinged, monumental showpiece with enormous JUMBO margins and captivating rich color, a true World Class GEM in a quality rarely seen on this normally tight margined issue, Superb, with photocopy of 2013 P.S.E. certificate for block of four, from which this stunning stamp was taken, this being the top left stamp from the block. Scott $130. Estimate value $500 – 750. 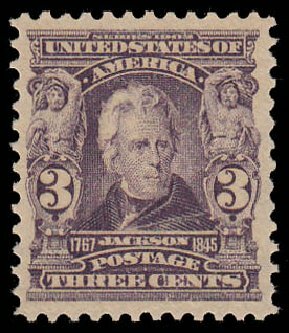 1903, 3¢ bright violet (Scott 302), o.g., never hinged, impressive example featuring huge JUMBO margins and an incredible depth of color, a very unusual stamp when found with margins with these proportions, Extremely Fine, 1992 P.F. certificate. Scott $130. Estimate $200 – 300. 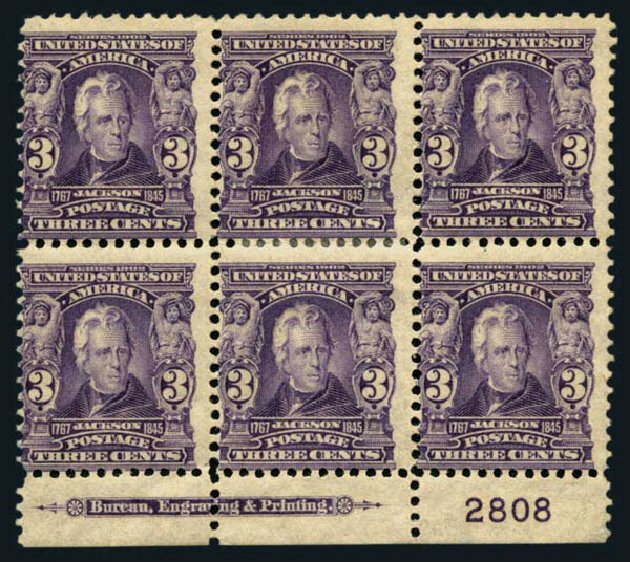 U.S. General Issues, 1903, 3¢ Bright Violet, Plate Block of 6, Imprint, #302, o.g., narrow bottom #2518, fresh and Fine, APS (2001) cert. Scott $800. Estimate value $150-200. 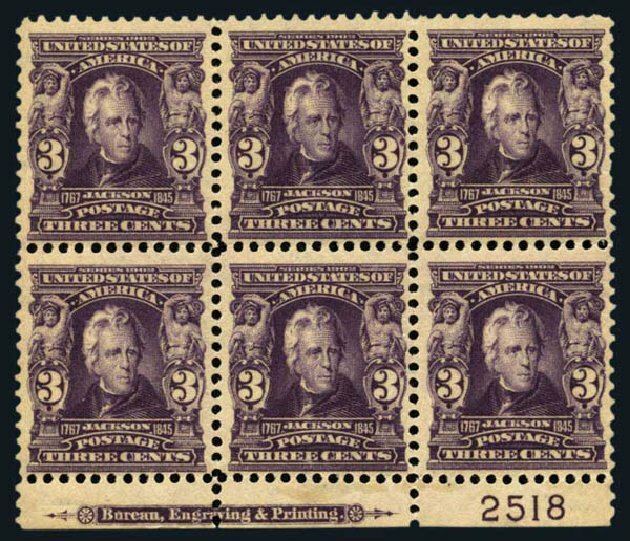 U.S. General Issues, 1903, 3¢ Bright Violet, Plate Block of 6, Imprint, #302, o.g. (h.r. ), narrow bottom #2808, Just Fine. Scott $800. Estimate $120-140. 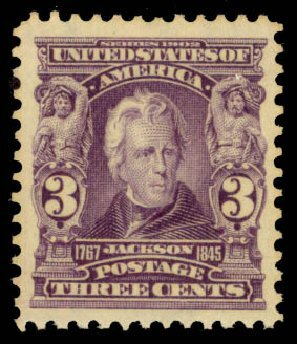 ** 3¢ bright violet (Scott 302), perfectly centered, post office fresh color and paper, original gum, never hinged, Extremely Fine and choice, SMQ value $825 (photo). $130 Expertization: 2005 P.S. E. XF-S95.